The world premiere of Hadrian by Rufus Wainwright, currently being produced by the Canadian Opera Company, has nothing to do with a guy building a big wall. Since I really didn’t know anything else about Hadrian going into this performance, I had very few expectations plot-wise. Being familiar with Wainwright’s singer-songwriter style, I had more expectations about the music. Still, I wasn’t sure how this would translate to the operatic form. It transpired that I was entranced by both the compelling story and the towering score. An ailing, feverish Hadrian travels through time to learn the truth about the mysterious death of his lover Antinous. His journey into the past is facilitated by a deal with the gods. Hadrian agrees to sign an order putting an end to Judea and the rise of monotheism, a harbinger of the end of the great, polytheistic Roman Empire, in exchange for two days with the love of his life and the truth about what happened to him. The deal reveals more than he bargained for and he must confront the grief he has inflicted on his wife and face a friend’s betrayal. Given Wainwright’s well-known talent for songwriting, I was very curious as to whether this work would be through-sung (as is often the case with contemporary work, although this trend seems to be receding). It turns out it wasn’t limited to through-singing. In my view, this work is best described as a seamless interplay of through-singing and more conventional operatic numbers such as arias and ensembles. The piece also shared similarities with opéra comique, there were short bursts of spoken dialogue to punctuate key moments. 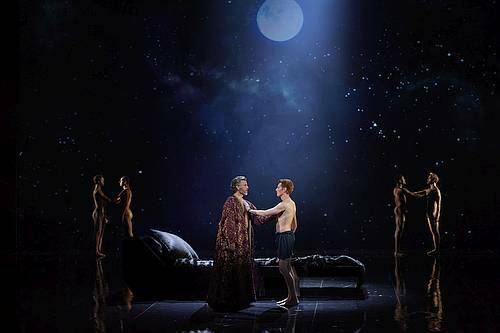 The overall effect was a complex textural mix that vacillated between dissonant, densely textured harmonies and exquisite lyricism that teased out vocal virtuosity from the superb cast. The music was far from the only noteworthy element of this standout performance though. The production was also visually arresting, making sophisticated use of projection as the backdrop. Projections were at times static, at times rippling with movement. In my view, the most stunning scene was Hadrian’s travel back in time. It was symbolically represented by red sand cascading from the ceiling centre stage. The time travel sequence is accompanied by elegant and seductive modern ballet choreographed by Denise Clark. The cast was a mix of COC favourites and debut performers. Thomas Hampson gives a spectacular debut performance in the title role. A commanding and regal stage presence is nicely paired with robust and virile baritone vocals. But his portrayal of Hadrian is by no means that of a rigid autocrat. Significant vocal warmth and suppleness convince the listener that this is also a man of great sensitivity and passion, capable of intense, all-consuming love. Given that this is a world premiere, I don’t have formal names for the arias and duets, but Hadrian’s first meeting and duet with Antinous (Isaiah Bell) is lyrical and sinuous and had me one hundred percent convinced of the profundity of their love. Isaiah Bell gives an equally strong performance as Antinous. I am acquainted with Bell’s work as a Baroque tenor, and his free, light, honeyed voice was well suited to this classical role in a new work. Bell is also a superb actor. Given the design of the plot, he has very little time to draw the audience into the character. In the scene where he and Hadrian meet, his body and voice are youthful, vulnerable and curious. Flash forward 6 years later, and he is not only Hadrian’s lover but his close advisor and confidante. The voice took on a richer, layered quality, with the body language to match. Ambur Braid, an alumna of the COC Ensemble and COC favourite, was divine in the role of Hadrian’s neglected wife, Sabina. Regal bearing is second nature for Braid given that she is well known for playing the Queen of the Night. But Braid brought a much softer quality to this role. Her performance of an aria that I will call “Where is your Heart?” was spectacular and heart-wrenching. This opera has several dense rousing choruses that are harmonically intricate and dramatically engaging, and the chorus under the direction of Sandra Horst should take a deep bow. This production and its roles are one for the history books. Musicians and historians will have a lot to learn from director Peter Hinton and the ensemble cast about how Hadrian is done. See it while it’s on stage and consider yourself lucky to be part of a history-making audience. Show times are 7:30 PM on October 13, 17, 19, 23, 25 with additional matinees at 2:00 PM on October 21 and 4:30 PM on October 27. Ticket prices range from $45 – $365. Patrons under 30 can purchase tickets for $22 or $35 here. Tickets are available online, or through the box office at 416-363-8231 (long distance 1-800-250-4653). Tickets can also be purchased on the TodayTix app and website for theatre tickets. Mooney on Theatre readers can get $15 off their first purchase at checkout with the code MOONEY.